With nearly three decades of dental experience, Dr. Howe opened Mt. Scott Family Dental in 1998, and has helped patients in Happy Valley achieve their dental health goals ever since. Dr. Howe loves getting to know patients and educating them about oral health. Dr. Howe is a native of Ames, IA where he completed his undergraduate studies at Iowa State University. In 1988, Dr. Howe earned his doctor of dental surgery at the University of Iowa, and he completed a general practice residence at the Oregon Health and Science University in 1989. 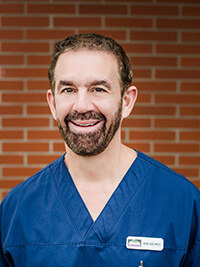 Well respected by his peers, Dr. Howe maintains memberships in numerous professional organizations including the American Academy of Cosmetic Dentistry, American Dental Association, Clackamas County Dental society, and the Oregon Dental Association. Additionally, Dr. Howe was recognized as a Fellow of the Academy of General Dentistry. This prestigious recognition is attained through years of advanced training and rigorous examination. Dedicated to extending the scope and advancing techniques in the field of dentistry, Dr. Howe also dedicates time to dental research and has been published in The Journal of the American Dental Association. During his spare time, Dr. Howe enjoys weight training, golfing, hiking, fishing, and watching sports. He also loves music, plays guitar, and has attended over 150 rock concerts.